Andela Nigeria Fellowship 2019 and How to Apply Online for Free. Andela Nigeria Fellowship 2019… Andela is a network of technology leaders dedicated to advancing human potential. We help companies build high-performing distributed engineering teams by investing in Africa’s most talented software developers. Based in NYC, SF, Lagos, Nairobi, and Kampala, Andela is catalyzing the growth of tech ecosystems across the African continent while solving the global technical talent shortage. The Andela Fellowship is a paid, full-time opportunity to advance your career by developing the skills needed to become a full-stack programmer. You’ll work on global engineering teams alongside professionals who will mentor you in your career. We’re looking for dreamers and builders with remarkable talent and limitless potential. Welcome to Andela where you will spend the first 6 months honing your technical abilities in a simulated distributed team that is well-run, organized, and demonstrating agile best practices, under the leadership of a strong technical team lead. During this time you will also be paired with our experienced engineers on our technology team, building the products that Andela uses every day. Once you’ve proven excellence in both tech and team skills, you will join one of our partner companies (which range from industry leaders like Viacom to high-growth tech companies like Commonbond, Github and Gusto) where you will work as a distributed full-time member of their engineering team. At Andela, we believe in lifelong learning and invest in your growth. Andela also provides you with state-of-the-art office space, great benefits, and a team of senior engineers and mentors to support your long-term growth. Over 80% of Andela Developers feel their work is very meaningful and 75% believe Andela provides a clear path for career advancement. Nearly all (94%) say they’re extremely proud or very proud of Andela’s brand and mission. You will work closely with engineering teams from the world’s leading technology companies delivering products and master both professional and technical skills required for your career. The technical assessment is comprised of a number of labs with test-driven development code to assess whether you have mastered the content in Andela’s open-source curriculum. Based on your assessment scores, you may be invited to a panel interview at an Andela office made up of staff members and developers. Andela’s in-person interview is evaluated through the lens of our four core values and an individual’s overall commitment. Applicants who pass the interview will be invited to participate in a two-week, simulated sprint led by senior Andela developers. The two weeks comprise of one week of home-based self-learning and one week of product development on-site at an Andela campus. We expect candidates to learn independently as well as on a team to deliver a final project. We’re looking for work ethic, passion, and teamwork. 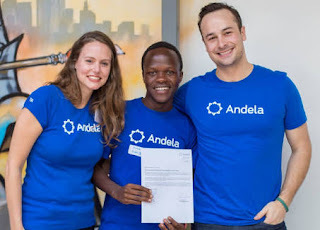 The highest performing candidates are offered employment and get to join the Andela Fellowship. Andela Nigeria Fellowship Cycle 36.1 2018/2019 is Out Online | Apply Now. Andela Nigeria Fellowship Cycle 36.1 2018… Andela is a network of technology leaders dedicated to advancing human potential. We help companies build high-performing distributed engineering teams by investing in Africa’s most talented software developers. We seek out exceptional people from a variety of backgrounds who are committed to unlocking their full potential and improving the world through technology. Complete a free application and personality/values assessment so we can learn how to further empower you as a tech leader. Based on the quality of outputs you create you may be invited to a panel of interviews made up of staff members and developers at an Andela office. Home Study Test: The Home Study test is a requirement for making it through our selection process. Please study and complete the Home Study Curriculumbefore your test. Please take this schedule into consideration before you apply. Application Deadline: 24th July, 2018.